Bography of Jawed Karim. 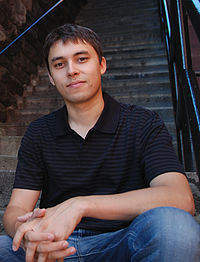 Jawed Karim was born in Merseburg, East Germany, in 1979 and moved to West Germany in 1980. His father, Naimul Karim, is a researcher from Bangladesh. His mother, Christine Karim, is a German scientist and research professor of biochemistry at the University of Minnesota. The name "Jawed" comes from the Old Persian language which means "eternal". he is a Bangladesh-German descent. He is a technologist and founder of the popular video sharing site YouTube. Many core components of PayPal, including real-time anti-fraud system was designed and implemented by Karim. Karim was born in East Germany, but he crossed the Berlin Wall and raised in West Germany. He moved to the United States with his family in 1992, two years after the reunification of West Germany and East Germans. He graduated from High School in Minnesota and he attended the University of Illinois at Urbana-Champaign. He left college before graduating became an early employee at PayPal, but in his education, he earned a Bachelor of Science degree in computer science in 2004. While working at PayPal, he met Chad Hurley and Steve Chen. The three men then set up a video sharing site YouTube in 2005. The first YouTube video, "Me on The Zoo" was uploaded by Karim on April 23, 2005. After co-founded the company and develop the concept of YouTube and a website with Chad Hurley and Steve Chen, Karim then enrolled as a graduate student in computer science at Stanford University as well as acting as an adviser on YouTube. When YouTube was acquired by Google, Karim received 137,443 shares, valued at approximately $ 64,000,000 based on the closing price of Google stock at the time. In October 2006, Karim gave a lecture on the history of YouTube at ACM's annual conference at the University of Illinois entitled ouTube: From Concept to Hyper-growth. Lecture material also contains pictures and videos of Karim, Hurley and Chen. from the garage days of YouTube. Karim returned to the University of Illinois in May 2007 as the commencement speaker at 136 universities, in which he describes his career. More recently, Karim has launched a venture fund called Youniversity Ventures, with the goal of helping students and the former to develop and launch their business ideas.